Ken’s Artisan Pizza opened July 5, 2006, following the success of Monday Night Pizza at Ken’s Artisan Bakery. The restaurant features a Le Panyol wood-fired oven, built by Master Mason Timothy Seaton, and seats 55 plus 10 at the bar. During summer months an additional 16 seats are on the sidewalk. The warm, airy space features gigantic Douglas Fir beams, big sliding glass windows, an open kitchen with the big igloo-shaped oven in the middle of the pizzeria, and tables and bar built from salvaged wood (old-growth Douglas Fir) that was once part of the late Jantzen Beach Big Dipper roller coaster (1923 – 1970). Prints of the vintage wooden coaster decorate one of the walls in the rear of the restaurant. 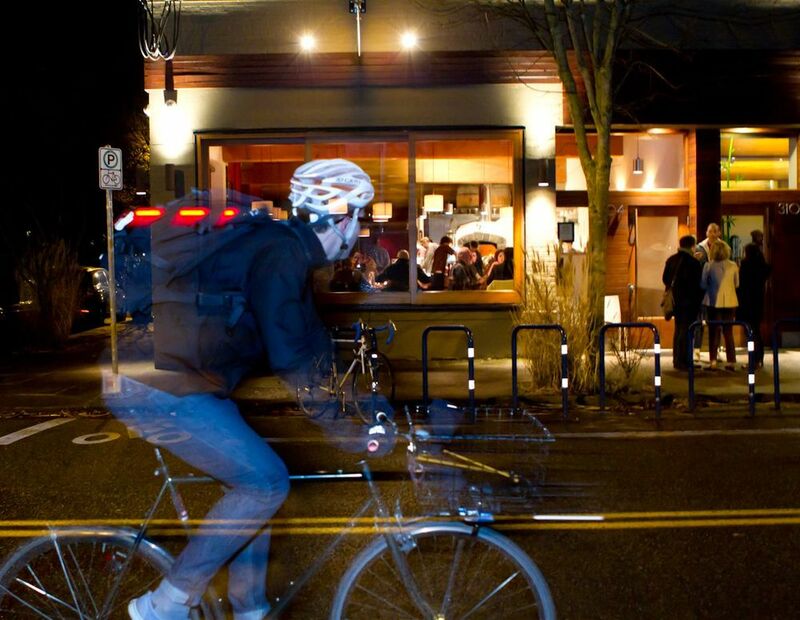 One of Portland’s biggest bike corrals is in front Ken’s Artisan Pizza and neighboring Bamboo Sushi on SE 28th Ave. On street bicycle parking is available for 24 bikes. The pizza at Ken’s Artisan Pizza is inspired by pizzas Ken has enjoyed during visits to Italy and elsewhere in Europe. Baked in the intense heat of a wood-fired oven, with a blistered crust, and topped with the best ingredients they can find, pizzas are baked in about 2 minutes time. In addition to great pizza, the restaurant offers a variety of salads and starters featuring local, seasonal produce delivered daily by our network of farmers—the Roasted Vegetable Plate is a particular favorite, and changes with each months’ crops. The restaurant also offers four beers on tap, and a 100-bottle wine list with an outstanding selection of local wines and 15 – 20 options by the glass. Ken’s Artisan Pizza has met with much acclaim and enjoys the frequent company of many repeat guests, creating a warm, friendly and festive atmosphere. 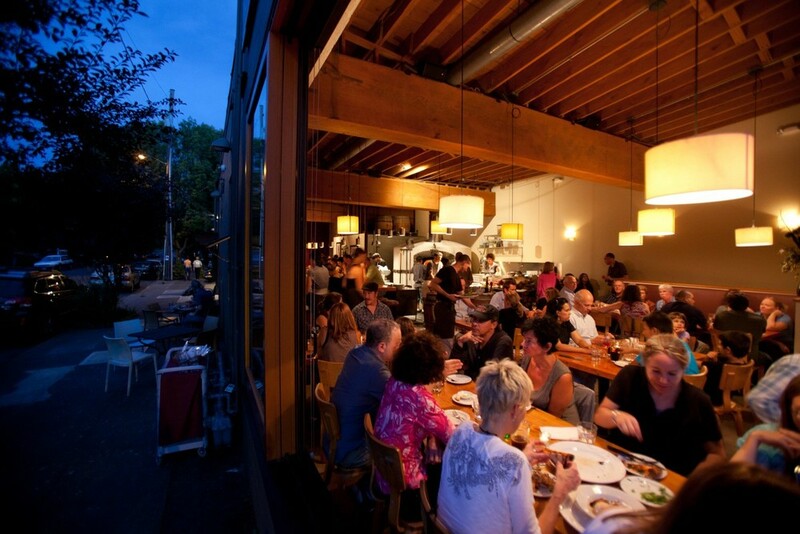 Ken’s Artisan Pizzeria carries 15-20 wines by the glass and 60-70 bottles of Sparkling, Rosé, White, and Red wines from the Pacific NW, Italy, France and Spain. We do not accept reservations. All members of your group need to be present before we can seat you. Takeout pizza is only available Mondays through Thursdays for walk-ins only. Takeout pizzas and starters are available on a limited basis when we can handle it. Sometimes we are too busy with in-house dining to offer pizza to go. Please understand our first priority is people eating in the restaurant. Takeout orders are limited: maximum of 4 pizzas.